Answers to these questions and MORE can be found at USGBC-Missouri Gateway’s OPEN OFFICE HOURS, where Chapter staff and leadership will be available to visit with you and answer questions. This is a new program that we will offer quarterly starting on June 24, 2013. See the schedule below and stop in anytime during the two hour OPEN OFFICE HOURS. Visit with USGBC-Missouri Gateway Staff and Leadership – Get to know us, ask questions, get involved! All OPEN OFFICE HOURS will be held at the Chapter’s office, located at 4651 Shaw, in the Missouri Botanical Garden’s Commerce Bank Center for Science Education (aka CBEC). Questions? Contact Emily Andrews at 314-577-0854. FarmWorks is a unique urban agriculture project being developed on the long abandoned site of the historic St. Louis Stamping Company. It includes four interconnected components-an urban farm, a transitional residential facility, a green business incubator, and an educational facility. The project will convert an abandoned part of downtown, create hundreds of jobs to boost the local economy, and pursue goals of reducing crime and homelessness. The project is pursuing LEED certification, and multiple green features are to be including in the design and construction: blackwater and greywater treatment systems, solar PV panels and solar hot water, a fleet of bicycles for use by residents and staff, the use of renewable and low emitting materials, and more! FEE: Free to USGBC-MGC Members, and full-time students. $20 for Non-members. Are you interested in learning more about the commissioning possess and what Building Envelope Commissioning (BECx) is? If so, you won’t want to miss our May 20th program! Attendees will learn about American Society for Testing and Materials (ASTM) standards like ASTM E2813, National Institute of Building Sciences (NIBS) guideline 3-2012, American Society of Heating, Refrigerating and Air Conditioning Engineer (ASHRAE) Guideline 0 -2005, and Envelope Design Guidelines for Federal Office Buildings: Thermal Integrity and Air tightness (NISTIR 4821). The presenter will give examples of activities that s BECx agent would execute during the project’s life cycle and share lessons learned from performing BECx on a Federal Building in West Virginia. David is a Certified Commissioning Authority that has Lead or has been a part of the commissioning process for over 9.2 million square feet with a combined construction cost of over 4.4 billion dollars. He is currently working for JACOBS Engineering on the SSA Data Center, on the World Trade Center, at West Point, at universities in Cambridge, MA , as well as a number of GSA buildings. He been involved with number of articles, books and presentations on commissioning, historical preservation and passive design. He currently sits on the Architectural Review Board for the city of Kirkwood , MO. Email us your lunch order from the Stadium Grille by 9 AM the day of the event and we will order it for you. Lunch is not included in the registration fee. A special New Member only event for members who have joined in the last six months! The U.S. Green Building Council – Missouri Gateway Chapter welcomes new members to come socialize and get acquainted with USGBC – Missouri Gateway! Chapter officers, past and present, will be on hand to share the chapter’s history, highlight member benefits & opportunities, and answer questions. Attendees will have the opportunity to meet fellow new members while enjoying a light breakfast. After new members have learned about the Chapter, they will tour Christner’s LEED Gold office space and learn about the office’s sustainable design, construction and operation features. Clear view corridors that link principle spaces and allow light to penetrate deep into the space. 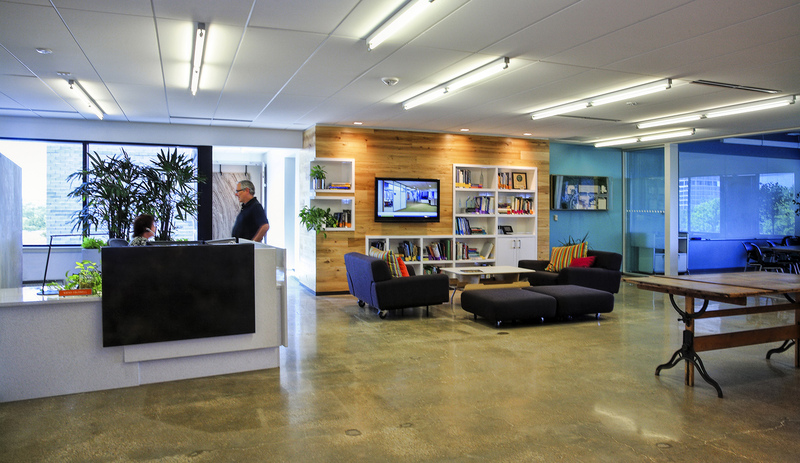 Everyone enjoys natural light and 96% of workspaces have direct window views. Occupancy sensor controlled lighting, a “paperless” initiative and the reduction of paper storage capacity by 50% (from the former office), and the selection of materials that contain low Volatile Organic Compounds (VOC). In the entrance lobby and primary public spaces, the existing concrete floor was ground and polished in lieu of an applied floor finish, eliminating energy associated with the manufacturing and shipping of floor materials. The textured wood paneling in the lobby and elevator core made of 100% recycled Elm from a dismantled dairy barn. RSVP Click here to register online. USGBC-MGC Ozarks Branch will be hosting a live webinar presentation on LEED v4, presented by the national USGBC organization. USGBC’s LEED green building rating system has been a significant driver for market transformation since its debut in 2000. USGBC is currently developing the version of LEED (v4) for release this year. This session will provide an update of the development process, a general overview of the technical changes proposed and information of specific interest to the chapter. It will also include an early look at supporting tools and resources for the LEED v4 program. Articulate the overarching environmental priorities of the LEED v4 program. Describe the new credits within the LEED v4 program and their environmental value. List the new market sectors that LEED v4 accommodates. Summarize the technical changes from LEED 2009 to LEED v4. Lonny Blumenthal, LEED AP O+M is a Program Delivery Associate in the LEED Department at the U.S. Green Building Council. Lonny assists in the development of the LEED v4 rating system, supporting documents, and tools. Additionally, he supports overall project planning, development, and implementation for all programs related to LEED: Rating System Development, Certification, Credentialing, and Education. Approved for 1.5 GBCI CE Hours (LEED Specific for BD+C, ID+C, and O+M) and 1.5 AIA LUs. GBCI CE Hours for this presentation will need to be self-reported. Drury University, Hammons School of Architecture auditorium, 900 North Benton Avenue, Springfield, MO. implementing sustainable practices, improving performance, heightening efficiency and reducing environmental impact in existing buildings through enhanced operations & maintenance. The specialty denotes practical knowledge in the LEED for Existing Buildings: Operations and Maintenance rating system. This course does not guarantee students will pass the LEED AP O+M Specialty exam. Additional time outside of class will be required for reading the required textbooks and further study. Registering and taking the LEED AP exam, and any associated costs, are not included in this course. This course prepares participants for the specialty portion of the LEED AP O+M credentialing exam. LEED AP exams are comprised of two parts: Green Associate & the Specialty. Candidates must pass both portions of the exam in order to receive LEED Accreditation. Learn about the 2013 Growing Green Awardees! 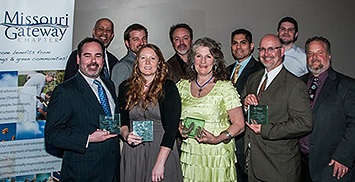 Once again we extend our congratulations to the 2013 Growing Green Awardees! Read more about their amazing work to transform the built environment here. 2013 Award winners pictured above from left to right: Sean Thomas, Old North St. Louis Restoration Group; Michael Smith, Southwestern Illinois College; Erik Lueders, Parkway School District; Hunter Beckham, SWT Design; Patty Maher, Tiger Lily Development; Tino Ochoa, Old North St. Louis Restoration Group; Jim Wolterman, SWT Design; Brock Piglia, SWT Design and Ted Spaid, SWT Design. Congrats! Download a list of all the nominees or learn more about the Growing Green awards here. Beginning May 1st, USGBC-Missouri Gateway will challenge public and private schools within the Chapter’s territory (Missouri and Southern Illinois) to devise and implement, with the help of green mentors, the most creative, effective and no or low cost sustainable practices for their schools. Applications will be available beginning May 1. Questions? 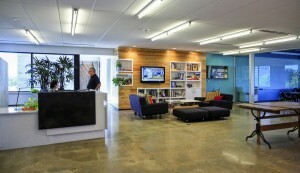 Contact USGBC- MGC at usgbc-mogateway@mobot.org or (314) 577-0225. 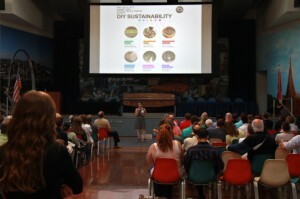 Reviews of our 2012 DIY Sustainability program delivered Pecha Kucha-style were so favorable, we’ve decided to do it again! Once again, we’ll take a fast paced and fun approach to explore a variety of fresh and creative DIY ideas for sustainable living. The U.S. Green Building Council- Missouri Gateway Chapter, in partnership with St. Louis Earth Day and St. Louis Green, is now accepting creative proposals for this program. We are seeking presenters and topic ideas surrounding the idea of ‘DIY’ (Do it Yourself) Sustainability. Presentations will be made using the Pecha Kucha format, which draws its name from the Japanese term for the sound of “chit chat” and allows presenters to showcase 20 slides that are set on a timer for 20 seconds per slide. This fast paced and fun approach will allow for a variety of topics to be covered in a brief period of time. Preference will be given to topics relevant to the build environment, but all ideas are welcomed and encouraged. Click here for more information and to submit your proposal. Presented in partnership with ASHRAE – St. Louis. Retro-Commissioning (ReCx) is an analysis of an existing building’s operation, maintenance, and use that yields an efficiency baseline. Speaker Ross Watson is a Professional Engineer with more than 20 years of experience in the building design and construction industry. He is currently a Commissioning Manager with Jacobs Engineering, where he has retro-commissioned over 8 million square feet of existing buildings. His experience includes LEED buildings, all aspects of energy efficiency, adaptive reuse and deconstruction, commissioning and troubleshooting heating, ventilation, and air-conditioning (HVAC) and co-generation systems, testing, adjusting, and balancing air and water systems, operating and configuring HVAC digital control systems, and analyzing systems operation following measurement and verification protocols. Ross will introduce the common phases in the ReCx process- planning, investigation, implementation and integration- and the lessons learned from each. He will also discuss how design and construction details can shorten the life of a building, share images of poor maintenance practices, and discuss how to avoid them. Attendees will gain an understanding of the intricacies of a variety of his retro-commissioning projects- including 90 Air Force facilities across Alaska and the Art Institute of Chicago’s Modern Wing addition. 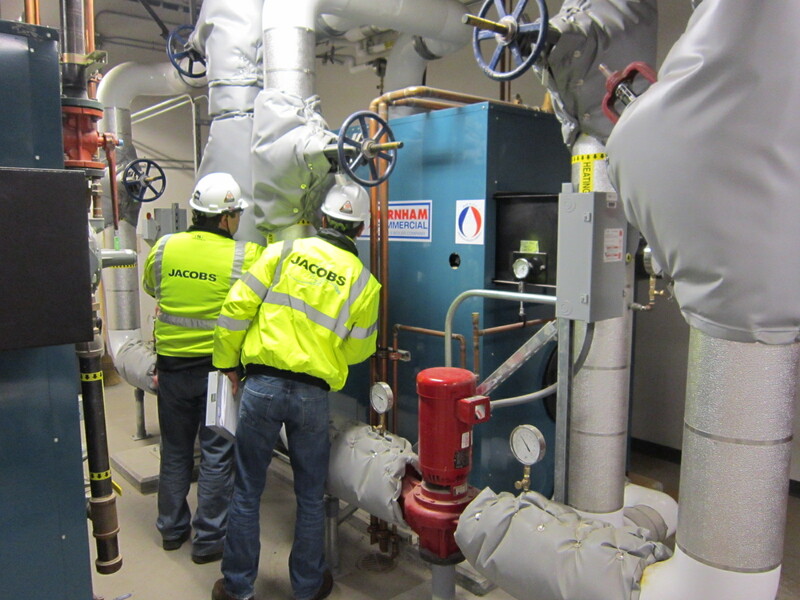 Free to USGBC-MGC Members, ASHRAE Members, and full-time students. REGISTER: Online Registration has closed. In-person registration will be available at the event.